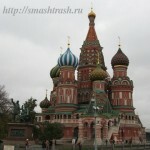 To begin with, I’ve been to Moscow several times and also I’ve read a lot about this magnificent city and its history. (If you have never been to Moscow you may say: To begin with I’ve never been to Moscow but I’ve read a lot about this magnificent city and its history.) You can’t but agree with me that Moscow is one of the most beautiful cities in the world. In my opinion the best way to see a strange city is to buy a map and a guide-book. Then I think you should follow the recommended sightseeing routes. Certainly, that is not enough to study the city well. If you would like to learn more about a city, it is useful to walk along the streets and look around to see historical places, buildings and monuments. There is no doubt that you should visit art galleries and museums. Besides this you may ask a resident of the city to advise you what places of interest you should see first. Moscow is the capital of Russia, its political, economic, commercial and cultural center. It was founded 8 centuries ago by Prince Yuri Dolgoruky in 1147. It stands on the banks of the Moskva River. About ten million people live in the city. Moscow is the seat of our Government. President of Russia lives and works there. In the 13th century Moscow was the center of the struggle of Russian lands for the liberation from the tartar yoke. In the 16th century under Ivan the Terrible Moscow became the capital of the new state. Though Peter the Great moved the capital to St. Petersburg in 1712, Moscow remained the heart of Russia. That is why it became the main target of Napoleon’s attack. Three-quarters of the city was destroyed by fire during Napoleon’s occupation, but by the mid-19th century Moscow had been completely restored. After the October revolution Moscow became the capital again. To my mind the best starting point of the tour around the city is Red Square. It is the place of parades, meetings and demonstrations. Here one can see the Cathedral of St. Basil the Blessed which was built in the mid-16th century in memory of the victory over Kazan. There is a legend that Ivan the Terrible blinded the architects Barma and Postnik, because he didn’t want them to create another masterpiece. Tourists can see the monument to Minin and Pozharsky (designed by Ivan Martos) in memory of the Russian victory over the Polish invaders in 1612. But without any doubt the heart of Moscow is the Kremlin. The first thing that meets the eye is the redbrick walls of the Kremlin, reinforced by 20 towers, five of which are also gates. The Kremlin's towers are unique in appearance. Built in 1485, the Tainitsky Tower is the oldest one. The highest of them is the Trinity Tower which is 80 metres tall. On the five tops of the Kremlin towers there are shining ruby stars. The clock that strikes every quarter of an hour is on the main Kremlin tower, the Spasskaya Tower. 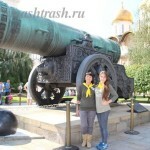 On the territory of the Kremlin you can see old cathedrals, the Bell Tower of Ivan the Great, the Tzar-Cannon and the Tzar-Bell, the biggest cannon and bell in the world. The Alexander Garden is situated near the Kremlin wall. In 1967 the Memorial architectural ensemble was set up over the Tomb of the Unknown Soldier. There are always a lot of flowers at the foot of the monument, especially on Victory Day. 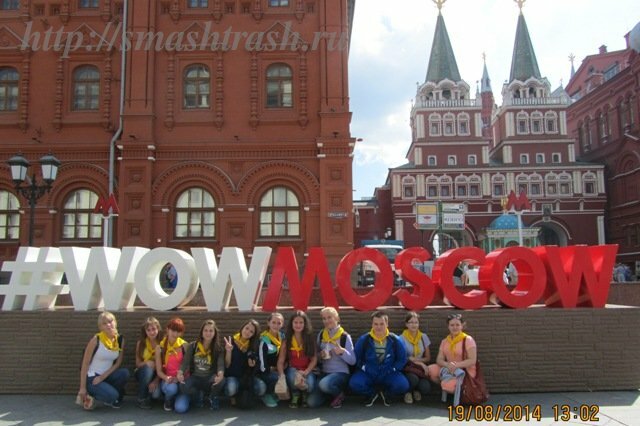 Moscow is a scientific and cultural centre where there are lots of institutes, universities, libraries, museums, technical schools, colleges and secondary schools. The largest museums of Moscow are the Pushkin Museum of Fine Arts and the State Tretyakov Gallery. If you are fond of art I’m sure the best way to spend your time is to visit these places. The Tretyakov Gallery was founded in 1856 by the merchant Pavel Tretyakov, a patron of the arts, who left his private collection as a gift to the nation. 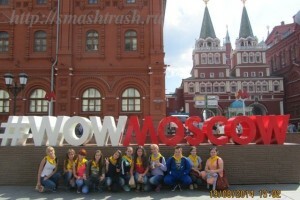 Since then it has become one of the most popular places of interest in Moscow. Here you can find old Russian icons and paintings by the outstanding Russian artists: Repin, Kramskoy, Serov, Perov, Levitan, Vasnetsov, Shishkin, Polenov and others. At the Museum of Fine Arts there are masterpieces by great European painters: Rubens, Van Gogh, Henri Matiss, Pablo Picasso, Rembrandt, Botticelli, John Constable and others. Moscow is a city of theatre-goers. It has more than 40 drama and musical theatres, including the Bolshoi Theatre with its famous ballet and opera, the Maly Theatre, the Vakhtangov Theatre, the Sovremennik, the Satire Theatre and many others. Muscovites are fond of sports. So, there are a lot of stadiums, swimming-pools, sports grounds and courts. The biggest stadium is Luzhniki. Moscow was the host of the 22nd Summer Olympic Games in 1980. The citizens of Moscow enjoy spending their weekends in parks, forests and gardens. For example, in the Park of Culture and Rest, in Izmailovo, Sokolniki, Fili they can see amateur actors, go boating and ride different attractions. Moscow is a very big city, and its transport must be comfortable and fast. One can see a lot of cars, buses, trolleybuses, trams in the streets of the city. The Moscow metro began its work on the 15th of May, 1935. There were 13 stations at that time. Now it has 190 stations. Our metro is a beautiful and convenient one. There are nine railway stations in Moscow and three main airports such as Sheremetyevo, Vnukovo and Domodedovo around the city. Also we say that Moscow is a port of five seas, as the Moscow-Volga Canal links Moscow with the Baltic, White, Caspian and Black seas and the Sea of Azov. To finish with, I’d like to say that certainly Moscow is worth seeing. Образцы писем о достопримечательностях Москвы Вы можете найти (здесь). Sample letters about Moscow sights can be found here. Talking on a phone and losing my mind. It feels so far, like a million miles. Give me, give me, give me, give me little hand. Just listen to your heart, don’t consider it. I see your eyes in city light. Moscow calling. Operator, don’t tease me. Moscow calling. Operator, what’s going on? Moscow calling. All the circuits are busy. Moscow calling. I’m going on, ain’t giving it up. 2. Party, party, party, party somewhere going crazy. And line is still busy. I wanna get paid for the weeks I stayed alone. I feel I’m gonna break this telephone. Please, feel free to use any content suitable for your studies or exam prep! Эта запись написана автором Елена Шрамкова, 10.12.2015 в 14:45, и размещена в категории Топики. Следите за ответами на эту запись с помощью RSS 2.0. Вы можете написать комментарий или разместить обратную ссылку на своем сайте.